Subject(s): Church membership, Confirmation - Instruction and study, and Confirmation - Presbyterian Church. The Teacher’s Guide, which includes a student book, provides the teacher with clear objectives for each lesson. It gives teachers a strategy for presenting the content of each lesson in a clear and concise manner. It contains dozens of innovative ideas for involving class members in active participation in the classes, and offers usable ideas for making each class session interesting for young people. 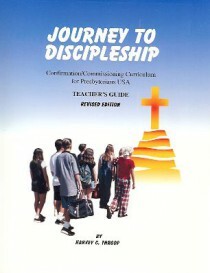 Journey to Discipleship enables young people to gain a basic understanding of what the church is all about, to learn some of the highlights of the story of God’s people, to become familiar with our Lord and Savior, Jesus Christ, to trace the beginnings and growth of the Church and to gain an appreciation of some of the disciplines of the Christian life. After reading the book, young people can have the beginnings of a firm foundation upon which to build their own faith and discipleship. Young People learn that the Bible’s story is really “our story” — the history we share in common as Christian believers. The study — 26 lessons in five units — can be reduced to 16 lessons by combining certain chapters (see “Shorten The Course” in the Teacher’s Guide). The students will become familiar with the faith heroes of the Bible. It includes an overview of the life and ministry of Jesus Christ and the meaning of his death and resurrection. Young people will study the reality that God’s call is a call to obedience that includes joys and trials, successes and failures. Disciplines of the Christian life, so important to young people’s on-going spiritual growth, are highlighted. Young people will familiarize themselves with the purpose and practice of worship, learn the origin and meaning of the sacraments, discover the purpose and place of prayer, appreciate the Bible as our book of faith, and study the nature of the Christian service to which we have been called as Christ’s followers. Biblical quotations are taken from the Good News Bible, the Bible in Today’s English Version.